Optimism returned during the first quarter of 2019, following a difficult fourth quarter during which the S&P 500 Index dropped 13.5%. Boosted by a suddenly dovish Fed and a White House that now seems reluctant to further increase tariffs on China, the S&P 500 posted its best quarterly gain since the third quarter of 2009 and its best first quarter since 1998. The S&P 500 index rose 13.7% during the first quarter, the Dow Jones Industrial Average was up 11.8%, and the Nasdaq jumped 16.9%. The first quarter of 2019 saw a shift in sentiment in non-U.S. markets as investors became optimistic that economic growth will stabilize and earnings growth will turn modestly positive. Key drivers of this shift in sentiment have been a seemingly less hawkish Federal Reserve, a decrease in trade tensions, and early signs of stabilization in China. Fixed income markets generally produced positive results during the quarter as a more cautious Fed ended three years of monetary policy tightening. Coming into the quarter, markets expected the Fed to continue raising rates well into 2019 and, perhaps, into 2020. Rising rates combined with the continued balance sheet runoff and hawkish comments from many other central banks set the expectation that yields would be moving higher and credit spreads would be widening. However, following its March Federal Open Market Committee (FOMC) meeting, the Fed left policy rates unchanged and also articulated a surprisingly detailed plan for concluding the balance sheet runoff. Falling interest rates positively drove returns as the 10-year Treasury bond yield dropped from 2.7% to 2.4% during the first quarter. In the U.S., equity markets resumed their uptrend following a short pause late in 2018. The economy, however, continues to slow, the yield curve inverted (the three month vs. the ten year inverted for four days), and year-over-year corporate earnings growth will likely be negative when first quarter results are reported. The year-to-date rally has pushed equity market valuations significantly higher. Margins are under pressure as a result of a stronger dollar and rising wages and input costs. Analyst revisions have moved into negative territory. For Q1 2019, 79 S&P 500 companies issued negative earnings per share guidance and 28 S&P 500 companies issued positive earnings per share guidance. Given these dynamics, it would be reasonable to conclude that a market pullback is becoming increasingly likely. Recent policy responses, including increased economic stimulus in China, improving U.S.-China trade talks, and a more dovish Fed, do have the potential to extend market gains and postpone such a pullback. In developed overseas markets, European equities remain challenged by weak economic momentum and political risks. Significant corporate earnings growth may prove difficult in this environment. Japanese equities are supported by attractive valuations, shareholder-friendly corporate behavior, central bank stock buying, and political stability. Uncertain earnings growth, however, is a key risk. Finally, a solid macro backdrop, near term resilience in China, and solid corporate earnings serve as tailwinds for Asia ex-Japan equity issues. A disruption in global trade or a greater-than-expected slowdown in China are significant risks to the region. Emerging market valuations remain attractive, even after the year-to-date rally, and fears about broad contagion from mid-2018 have fallen. Accommodative policy measures in China and a dovish shift by the Federal Reserve are tailwinds. Risks to the asset class do exist. 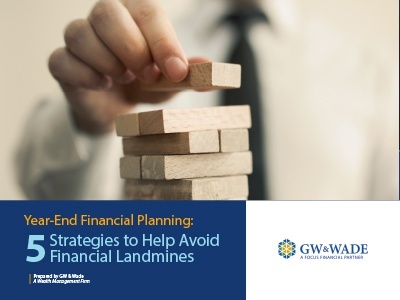 For example, if the Chinese economy fails to avoid a significant slowdown despite stimulus efforts by the government or if the U.S.-China trade dispute escalates or drags on, emerging market stocks are likely to suffer. A slowing, but still growing, global economy should be supportive of fixed income markets. Global inflation pressures remain subdued, and are unlikely to drive short term changes in world monetary policy. The current less-aggressive stance from the Fed has eased pressure on fixed income assets from rising short term rates. Coupon income, rather than capital appreciation, should be the dominant driver of bond returns in the quarters ahead. Given late cycle dynamics and the expectation of volatility, we anticipate the historically negative correlation between U.S. equity and government bond returns to hold in the near term. In other words, expect Treasuries to act as a buffer when risk assets sell off. If you have any questions, we encourage you to contact your GW & Wade Counselor or you can reach us at info@gwwade.com. 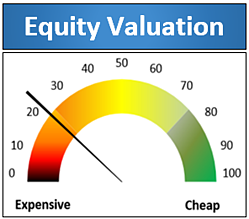 Based on the S&P 500 trailing twelve-month Price-to-Earnings ratio, a gauge of U.S. equity valuation registers a current reading in the 23rd percentile. 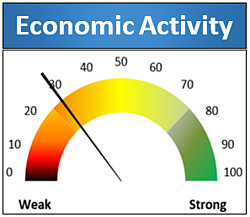 Based on the Federal Reserve Bank of Philadelphia’s U.S. Coincident Index, a gauge of U.S. economic activity registers a January 2019 reading in the 29th percentile.